WELLESLEY, Mass. - To make history, it takes a once in a generation player. For Needham, Thomas Shaughnessy is just that. On Monday night, in front of a packed Wellesley High School, Shaughnessy scored 22 points and dished out seven assists, as the Rockets clinched their first trip to the sectional final in school history with a 69-66 win over BC High. The Rockets (19-4) will take on Mansfield in the Division 1 South Sectional Final on Friday night at Taunton High School. Needham coach Paul Liner said making the sectional final is a dream come true. While Shaughnessy showcased his talents, BC High (20-3) point guard Travis Evee (22 points) displayed his abilities as well, knocking down two treys in the fourth quarter while also driving to the basket for an and-one. The back and forth between the two team’s respective stars was on full display in the fourth quarter. 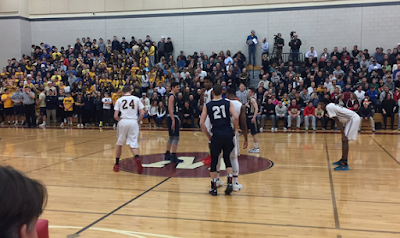 Needham took a 48-45 lead into the final frame, but BC High tied it up on a Myles Owens and-one. Shaughnessy drove to the basket for a layup to put Needham back on top, but Evee promptly splashed a deep trey from the right wing to give the Eagles a one-point edge, 51-50. Two Troy Salmans free throws pushed BC High’s lead up to three, but a three pointer by Brandon Monheimer from the left corner evened the game up. Moments later, Shaughnessy gave Needham a one-point lead on a shot from the charity stripe, but Evee came right back with an and-one driving layup to hand the Eagles a 56-54 advantage. As he did all night, Shaughnessy had a response. This time Shaughnessy used his talents as a facilitator, driving through the Eagles’ defense and dishing it off to Will Cooper (15 points) for an and-one of their own. Shaughnessy put the final nail in the coffin on the Rockets' next time down the floor, using a screen to get separation before burying a step back three from the top of the key. BC High never was able to get closer than two following that, with Monheimer and Shaughnessy icing it from the free throw line. The two sides also went back and forth throughout the first half. Shaughnessy helped the Rockets jump out to an early 13-11 lead, but Owens connected on a pair of triples as part of an eight point opening quarter to lift BC High to an 18-17 lead after one. In the second quarter, Needham was able to find scoring from the likes of Matt Shaker and Cooper. Cooper hit two foul line jumpers, while Shaker drilled a three pointer from the left wing. At the opposite end of the floor, the Eagles found success dumping the ball down to Jordan Minor and Troy Salmans. Minor finished on a put back for an and-one basket, and Salmans corralled an offensive rebound and dished it out to Evee for a mid range floater. Needham held a four-point edge with under a minute to play in the half, but Matt Thompson hit a three pointer to pull BC High within one, 33-32, heading into the break. Needham and its next opponent, Mansfield, have only met in the tournament once, a Mansfield victory back in 2011.